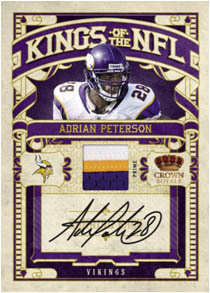 Each pack will deliver an autograph or memorabilia card, 2 Crown commons, 1 Crown Rookie and 1 Insert or Parallel. Autographed Crown Rookie Cards featuring Sam Brandford, C.J. 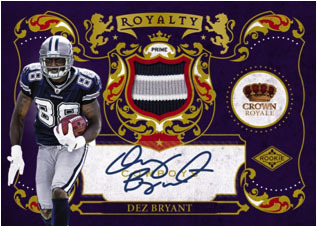 Spiller, Ryan Matthews, Dez Bryant and Tim Tebow seq #'d to 499 or less. 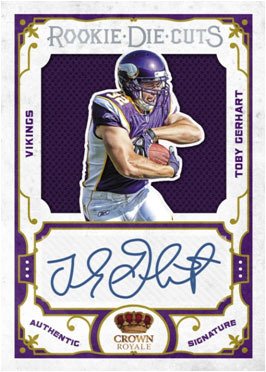 Autographs featuring Joe Namath, Jim Brown, Joe Montana, Barry Sanders, Brett Favre, Tom Brady, John Elway, Tony Romo, Drew Brees, Peyton Manning, Adrian Peterson and Chris Johnson seq #'d to 50 or less. 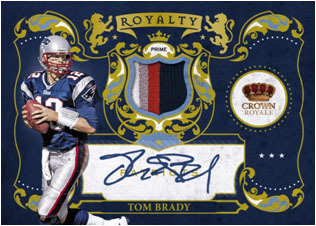 Look for Crown Die-Cut parallels featuring Blue, Gold & Green Crowns seq #'d to 100 or less (Autograph versions seq # to 50 or less). 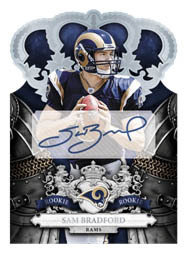 Look for RPS Rookie Signature Die-Cuts featuring a die-cut around player image with a jumbo swatch of material seq #'d to 50 (prime versions seq #'d to 10). 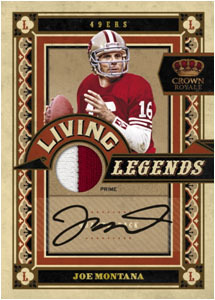 Crown Royale is a classy designed middle to high end football card offering highlighted by a great combination of past legends like Barry Sanders, current legends like Brett Favre, and future legends like Tim Tebow. 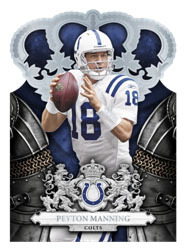 Crown Royale also knows how to die cut a card, so if your a fan of the die cut, you might want to check out Crown Royale come late November. Online Football social network to share videos and photos with your friends and football fans.